Search Results for "pupil dilate"
MACRO CLOSE UP: Mesmerizing female green eye with a slightly dilating pupil. 1940s: Human eye pupil dilates. Man walks through room, turns off light. Blue human eye dilating and contracting. 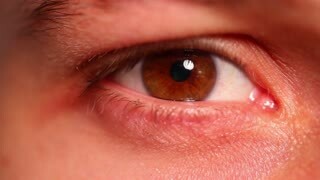 Very detailed extreme close-up of iris and pupil. MACRO CLOSE UP: Google search on PC monitor reflecting onto green eye surface. MACRO CLOSE UP Eye surface reflecting the world map showing on computer screen. Static extreme macro close up shot of an eye filled with red blood vessels blinking and looking horrified. Adult man laughing with eyes. Extreme close-up view. Wrinkles around the eyes from laughing. The man's eyes narrowed. 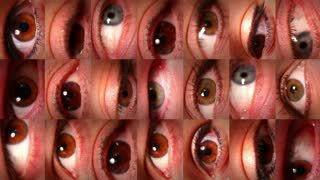 Human eyes fast open up and shut down. Caucasian male face close open eyes. A blue eyed woman with mascara on looks at the camera and blinks. Extreme close up on a single eye. Slow motion. A woman with blue eyes who is wearing mascara, opens her eyes in a profile close up.